A video shot outside of Vancouver, British Columbia, during a forest fire unexpectedly captured a lot more than firefighting efforts. On July 17, 2014, Castanet.net, a news organization in Western Canada, posted a video shot in West Kelowna — northeast of Vancouver — featuring efforts to stop the Smith Creek Wildfire. Here’s the original Castanet.net video report, showing the UFO at approximately 26 seconds. Shot out from the clouds above the mountain during a forest fire near our neighborhood. It pulled a wisp of cloud with it as it exited. A forest fire broke out on the mountain behind us and during the attempt to put it out, this event took place. I was watching a video online of the fire from a little earlier in the day and I spotted the UFO 37 seconds in. I have no idea whether anyone else has noticed this or not. Most folks would be focused on the fire. 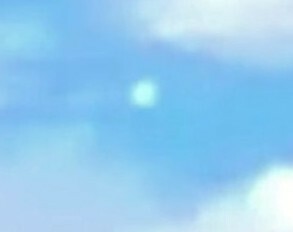 37 seconds into the video the UFO comes shooting out from a cloud right above the mountain and passes through a clear spot back into the next cloud. I was quite startled and surprised when I saw it. The UFO left a thin trail of cloud vapor as it exited the cloud. This, to me, eliminates any thought that this might be a camera lens artifact or light phenomenon effect. The event lasted only a few seconds. Judging by the distance I was from the object it had to have been moving very fast. The scene cuts away while the UFO is still visible. I’m left to assume that there must be more footage of it than I saw. I phoned the website’s news department to ask if it would be possible to see the full footage, but was met with disapproval. In retrospect, perhaps I shouldn’t have mentioned the word UFO. While no official explanation has surfaced about the UFO, OpenMinds.TV asked Marc Dantonio, chief photo and video analyst for the Mutual UFO Network, aka MUFON, to look at the video. He suggests the object could have been a bolide, a type of very bright meteor that streaks through Earth’s atmosphere. “I am convinced that this was a really good find,” Dantonio told Open Minds. “It is an Earth-grazer, a meteor that approaches the atmosphere at a shallow angle, and continues on, skipping off the atmosphere back into space. Some of them will slow down enough to become trapped and fall to Earth but they many times just skip on off and keep going.